In this pAsuram, mAmunigaL is following AzhwAr’s pAsurams of revealing his great desire for kainkaryam and is mercifully explaining it. How is that done? As AzhwAr meditated upon the cruel nature of this connection with the material body and became filled with sorrow, emperumAn manifested his divine presence in northern thirumalA (thiruvEngadam, thirumalA thiruppathi) to change AzhwAr’s mood, AzhwAr approached him and realised his true nature as said in thiruvAimozhi 3.2.10 “nilaippeRRu en nenjam peRRAdhu nIduyir” (my broken heart acquired stability and the AthmA acquired eternity) again; AzhwAr then thought “we should serve emperumAn matching our true nature” and desired to perform faultless service at the divine feet of thiruvEngadamudaiyAn (SrInivAsa), and highlighted the same in thiruvAimozhi 3.3 “ozhivil kAlam ellAm“; mAmunigaL mercifully explains this starting with “ozhivilAk kAlam“. Oh heart! Praise the beautiful divine feet of AzhwAr who attained great bliss by enthusiastically setting out to perform faultless kainkaryam at all times to emperumAn remaining together with him, who is in thirumalA which is having tall peaks. ozhivilAk kAlam udanAgi manni – Thinking about performing kainkaryam in all places, all times and in all states. vazhu ilA AL seyya mAlukku – desiring to perform all types of kainkaryams to sarvESvaran, without slipping from any aspect of servitude. ezhu sigra vEngadaththup pAriththa – desired in thirumalai (thiruvEngdam) which has tall peaks. Just as iLaiya perumAL (lakshmaNa) desired to perform all kainkaryams to sIthAp pirAtti and SrI rAma in thiruchchithrakUtam as said in SrI rAmAyaNam ayOdhyA kANdam 31.25 “bhavAmsthu saha vaidhEhyA girisAnushu ramsyathE | aham sarvam karishyAmi jAgrathas svapathaSchathE ||” (While you enjoy with sIthA in the foothills of the mountain, I will serve you both in all ways), AzhwAr too desired to serve the divine feet of thiruvEngadamudaiyAn who is having SrI mahAlakhsmi in his divine chest, and is residing in thirumalai which is having huge peaks. 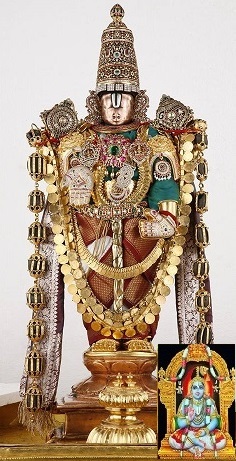 mikka nalam sEr mARan – AzhwAr who has unlimited bhakthi as said in in SrI rAmAyaNam AraNya kANdam 34.13 “anurakthaScha bhakthaScha” (adherent devotee), and in perumAL thirumozhi 8.5 “ARA anbiLaiyavan” (lakhmaNa who has endless love for SrI rAma), thiruvAimozhi 6.10.2 “ARA anbil adiyEn” (I who am a servitor, having endless love). pUngazhalai nenjE pugazh – Oh heart! Just as AzhwAr served emperumAn‘s divine feet as said in thiruvAimozhi 6.10.4 “pUvAr kazhalgaL” (divine feet covered with flowers), you praise the divine feet of AzhwAr which are beautiful and tender like flowers. Try to engage your faculty of speech in his service. kainkaryam [to emperumAn] which is highlighted in the second sentence of dhvaya mahA manthram, extends up to emperumAn’s devotees. By this, the meanings of “ozhivil kAlam ellAm …” [1st pAsuram] is mercifully explained here. Further, the following principles which were mercifully explained by AzhwAr in the subsequent pAsurams in this decad are also considered by mAmunigaL. “thiruvEnkada mA malai onRumE thozha nam vinai OyumE” (as we worship the thirumalai hill, our hurdles will be removed) [8th pAsuram] showing the hurdles for kainkaryam will also be removed by thirumalai AzhwAr itself. This entry was posted in Other, thiruvAimozhi nURRandhAdhi on December 20, 2018 by Sarathy Thothathri.